Since YouTube has intensified the crackdown of copyright infringement, it is much harder than ever to download and convert YouTube to MP3 on Mac/PC. What if you need the audio MP3 from YouTube videos? How do you convert YouTube to MP3 safely and steadily? Here we provide you with the best and professional YouTube to MP3 converter Mac to help you download and convert YouTube to MP3 to Mac, iPhone, iPad, etc at will. 5KPlayer, a standalone and professional YouTube to MP3 converter Mac (High Sierra/Mojave)/Windows, will save you from the YouTube to MP3 Mac problem and offer you an easy way to download any MP3 soundtrack from YouTube movies/TV shows and convert any popular music videos to MP3 on Mac in one click to enjoy on MP3 player or portable devices like iPhone (X), iPad, Android, etc. Why You Need to Convert YouTube to MP3 on Mac? * Convert YouTube to MP3 on Mac to avoid the 30 sec ad if you only want to appreciate the 15 second audio. * Convert YouTube to MP3 on Mac to collect the specific and useful audio from part of a video. * Convert YouTube to MP3 on Mac to get the hot singles MP3 when only the music videos MP4 is available to download. * Convert YouTube to MP3 to Mac/PC/iPhone etc to assure that you won't miss any wonderful YouTube audio file when it's removed or altered by YouTube or by the author. 5KPlayer is such an application to convert YouTube to MP3 on Mac besides video music playback and media AirPlay. This smart and free YouTube to MP3 converter Mac can automatically detect YouTube videos and download them to MP3, AAC, FLAC, MP3, MKV, WMV and more in high quality for iPhone iPad and Android. Compatible with 300+ online sites, 5KPlayer also downloads 4K HD 1080p 720p etc videos to MP3 from Dailymotion, Vevo, Facebook, etc as easy as ABC. MediaHuman YouTube to MP3 Converter for Mac would be an ideal choice for you when you'd like to listen to MP3 music from YouTube offline on your favorite portable device like iPhone, iPod or digital audio player. Or when you have found beautiful soundtracks of new movies on YouTube, Dailymotion or Vimeo, you can save the MP3 audio to your music library as MP3 via this free YouTube to MP3 converter for Mac. With ultra clean and intuitive interface, DVDVideoSoft YouTube to MP3 Converter for Mac is an easy-to-operate software to download and convert YouTube to MP3 on Mac with super fast conversion speed that you can listen to MP3 music offline on all of your devices freely. Whatever YouTube videos you throw at this YouTube MP3 converter Mac, it will automatically and quickly convert them to MP3, M4A, AAC, WAV, WMA and more. Actually, there are not as many YouTube MP3 converters Mac as Windows, FLVTO YouTube Downloader for Mac just happens to be the one luckily. Please do not be fooled by its name, FLVTO free YouTube to MP3 converter Mac is a professional YouTube video downloader and player, as well as YouTube to MP3 converter Mac that you can use it to download YouTube videos into multiple formats such as MP3, MP4, AVI, FLV , etc in a hassle free way. How to Download and Convert YouTube to MP3 on Mac Free? Download and convert YouTube video to MP3 format with the safe, fast and highly customizable YouTube MP3 converter Mac 5KPlayer in a click will save you much time. 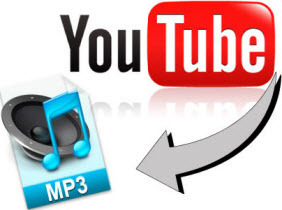 This YouTube MP3 Mac software compatible with almost all video file formats has a great ability to download online YouTube video MP4 AVI MKV WMV FLV MPEG MTS 1080p HD etc and convert them to MP3 AAC FLAC etc in seconds. If you have collected any downloaded YouTube video in your local file, you can also use this free YouTube to MP3 converter Mac to get the MP3 audio. Step 1. Free download this YouTube MP3 downloader Mac or Windows, install and run it on your computer. Step 2. Find the YouTube video you want to convert and copy the video URL. Step 3. 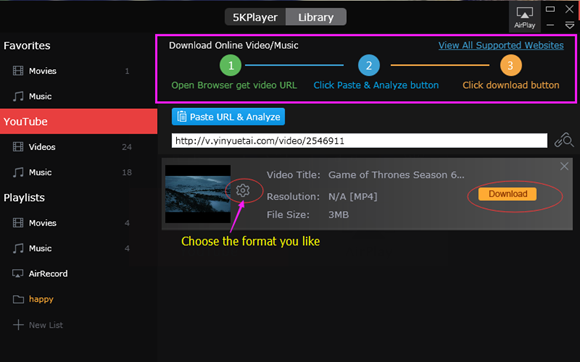 Click "YouTube" icon on the main interface of 5KPlayer to access to the download windows, then click "Paste URL & Analyze" button to analyze the video URL. Step 4: After the analyzing process, you can click "Download" button to download the YouTube video. Step 1: Find the downloaded YouTube video in the "Videos" or "Movies" list on the left menu of 5KPlayer. Step 2: Move your mouse to the video file and a "Convert" button with a drop-down menu will pop up. Step 3: Choose "Convert to MP3" to convert your YouTube to MP3 file. There are also "Convert to AAC" and "Convert to MP4" icons with various output formats available for you to convert YouTube to AVI, MKV, MOV, FLV, SWF, etc for any device. PS: If you want to convert your locally-stored videos downloaded from YouTube or any other online sites, you can just play them with 5KPlayer and then follow the convert steps mentioned above. 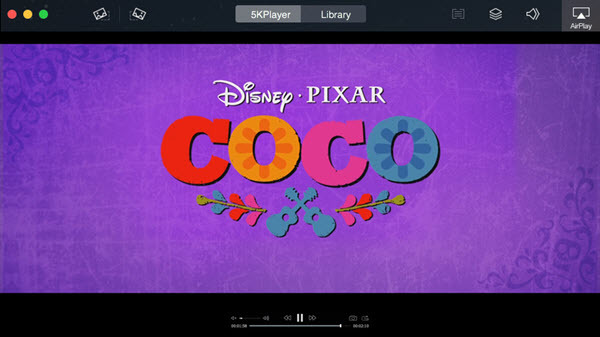 As a three-in-one software, 5KPlayer is also a YouTube video player and AirPlay server which is capable of playing YouTube 4K UHD 1080p HD 3D 360 VR MP4 MKV etc videos smoothly and AirPlay YouTube videos from iPhone to Mac/Windows wirelessly. The best YouTube to MOV converter quickly downloads YouTube videos and convert to MOV at will.